Civil servants are soon to be given greater powers when new legislation, currently being considered by our legislators, is enacted. The legislation is the Civil Service Regulation (Amendment) Bill 2018 https://hr.per.gov.ie/wp-content/uploads/Draft-General-Scheme-of-the-Bill-2018.pdf . As a prelude to the Bill, a Regulatory Impact Analysis (RIA) was produced by the Department of Public Expenditure and Reform. The RIA is published on the Department’s website https://hr.per.gov.ie/wp-content/uploads/Regulatory-Impact-Analysis-2018.pdf which makes for interesting reading. The new legislation will amend the Civil Service Regulation Acts 1956-2005 and the Public Service Management Act 1997. Box 1 summarises the key objectives of the new legislation. These changes will contribute to help a commitment in the Civil Service Renewal Plan to “strengthen the disciplinary code to enable managers to take more effective and decisive action as required to tackle underperformance, including exits.” Furthermore, one of the strategic priorities of the People Strategy for the Civil Service 2017-2020 is to “Build, Support and Value Managers as People Developers”. The key provisions of the proposed legislative amendments will contribute to the achievement of this priority by empowering managers to manage their staff effectively rather than having all serious sanctions determined at the very top of an organisation. § Give full effect to the legislative intent behind the Public Service Management Act 1997, i.e. to devolve responsibility for disciplinary matters below the level of Secretary General/Head of Scheduled Office. § Allow for the function of dismissal to be assigned below the head of the organisation. § Enable the introduction of a binding internal appeal for civil servants. § Facilitate a two-stage appeals process for the most serious disciplinary sanctions, i.e. an internal and external appeal. § Reduce delays related to the current structure of disciplinary and appeals processes. § Bring the civil service disciplinary and appeals process in line with external practice. § Empower civil service managers to manage their staff effectively by providing access to a fuller range of discipline management tools. § Allow for more flexibility in the management and reform of the civil service disciplinary process and related appeals process. Why do a Regulatory Impact Analysis? In April 2018, the Government approved the drafting of the Civil Service Regulation (Amendment) Bill 2018. The Regulatory Impact Analysis (RIA) examined how best to implement the Government decision. Before examining the specific features of this RIA, it is useful to recall why RIAs are undertaken - see Box 2. Box 2: What is the point of doing Regulatory Impact Analysis? Regulatory Impact Analyses are needed to underpin good laws and regulations that help to protect citizens' rights, promote a safer society and ensure more confidence in goods and services. Before laws and regulations are drafted there is need to establish what the best course of action is. This requires an assessment of alternative solutions; measuring the costs and benefits of different options, undertaking consultation with interested parties and recommending a "best option". Taken together, these elements provide a best practice approach to regulation. Consolidate, restate and amend legislation: Create a new consolidated Act to replace the Civil Service Regulation Acts 1956 – 2005 and the Public Service Management Act 1997 to modernise and simplify the current legislative framework. Amend existing legislation: an Act to amend the Civil Service Regulation Acts 1956 – 2005 and the Public Service Management Act 1997 which will change the specific sections necessary to effect the Government Decision, revise some of the outdated provisions and provide for related matters. Following analysis, the RIA concluded that the preferred option was Option 3. 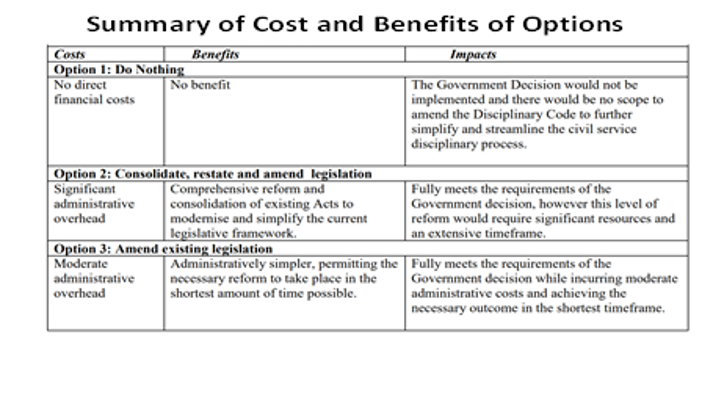 This option was considered best placed to achieve the policy objectives within the desired timeframe. Amending the existing legislation would allow for the Government’s decision, to devolve disciplinary powers within the Civil Service, to be fully realised within the shortest timeframe and with less resources than a full consolidation, restatement and amendment of the legislation would demand. Workshops: HR Managers workshop (one); Line Managers workshops (three) and a Union Representative workshop. The Office of the Attorney General was consulted in relation to proposals contained in the draft General Scheme. A workshop was held with a working group of HR Managers to discuss the practicalities of further amending the disciplinary decision-making and appeals process. In addition, consultation was carried out with Departments and Offices as to how the proposed new definition of Appropriate Authority should apply to them. The proposed legislation should allow for the streamlining and strengthening of the disciplinary and associated appeals process, in the Civil Service, through the devolution of authority for disciplinary decision making and appeals further down the line. Moreover, the reform should help to address the elaborate structure that exists at present. Finally, the wide-ranging consultation and analysis undertaken for these Regulatory Impact Analysis augers well for legislative change that will produce positive and workable results. 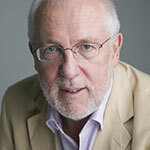 On Friday 22 March Tom Ferris will lead an update seminar on Regulatory Impact Assessments. Click here for more information, or to reserve your place.